Tobiano is probably the best recognized of all the white patterns. It almost always results in white legs. It will cross the top line at the shoulders and hip before other areas and fights to leave the chest, flanks and head colored. It commonly results in a solid head and white tail head. Some theorize that Tobiano doesn't add face white but whether this is true or not is still open for conjecture. When Tobiano is mixed with other white patterns we can get a solid white or nearly white horse but rarely, if ever, does Tobiano express to that extent alone. When Tobiano is very minimal it will usually express as four white stockings or socks sometimes with a wither or neck spot. In miniature horses, it's expression can be found at it's most minimal, at times leaving only the back two feet white. When Tobiano is mixed with other white patterns it is often called “Tovero”. Which simply means Tobiano + Overo. This can be a bit confusing as there are four (4) white patterns that fall under the “Overo” umbrella. These are Frame (Lethal White Overo), Splashed White, Sabino and Dominant White. It is when Tobiano combines with Splashed white that we see the almost or near white horse. Splash, especially homozygous splash, seems to “boost” Tobiano imparting more white than when either of the patterns are present alone. It is Tobiano and Splashed White that gives us the “medicine hat” pattern as Tobiano will fight to keep color on the chest and flanks while splashed white will provide the bald face and barrel white. It is not uncommon for Frame (Lethal White Overo) to hide in a horse that looks Tobiano. It is therefore important to test all breeding stock to eliminate the possibility of producing a Lethal White Foal. Sabino and Dominant White will add additional white and roaning to the coat (white hairs mixed into full color areas) but they don't seem to provide the boost like splashed white does. Often the Tobiano horse with Sabino will have a blazed face and dark eyes. Dominant White and Tobiano is not well studied but it is assumed it will express similarly to Sabino. A Dominant White horse with Tobiano may express as nearly solid white as some Dominant White horses are nearly all white without the presence of Tobiano. 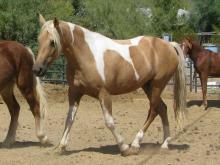 When Tobiano is homozygous you often get small colored spots in areas of white. These are called “cat tracks”. In the days before genetic testing, these where often used as an indicator of homozygosity but they are not a foolproof method. Some horses that are homozygous for Tobiano lack them, while others that are heterozygous, have “cat tracks” or markings that are easily mistaken for them. Today genetic testing has taken the place of the “cat tracks” with a Tobiano test available at most of the labs that offer genetic coat color testing. Tobiano is the result of a large chromosomal inversion on equine chromosome 3 and is inherited as a dominant trait. This means that with the exception of “cat tracks” TOto horses are indistinguishable from TOTO horses. Because of Tobiano's close proximity to Extension (Tobiano and Extension are both on chromosome 3), Tobiano is “linked” with Extension. If for example, an Ee horse carries Tobiano, Tobiano will be “linked” with either E or e. If Tobiano is linked to E all the foals that inherit E from this parent will also inherit Tobiano while the foals that inherit e will not inherit Tobiano. 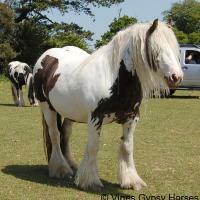 Lets consider a black and white stallion who is Ee TOto (with Tobiano linked to E) and bred to solid chestnut mares. All of his bay or black foals will be Tobiano while all of his chestnut foals will be solid. Occasionally a “cross-over” will occur. This means that instead of Tobiano being linked to E it will instead become linked to e. This is thought to occur in 3%-7% of breedings. So in our example case 3%-7% of this stallions offspring will be Tobiano chestnut or solid Bay or Black. Tobiano is even closer to the KIT gene (also on Chromosome 3) than to Extension. In fact, Tobiano may cause it's white pattern by disrupting the function of KIT. Because of this very close proximity, the linkage between Tobiano and KIT is even tighter than between Tobiano and Extension. This makes it very unusual for a horse to be both homozygous for Tobiano and carry an additional KIT gene mutation (such as Sabino 1 or Dominant White) or be homozygous at KIT and carry Tobiano. The rare existence of such horses would be the result of a one-in-a-million cross-over event. If you know of horses that have been tested to be homozygous for Tobiano and also carry classic roan, Dominant White or Sabino 1 or that are homozygous for classic roan or Sabino 1 and also carry Tobiano I want to hear from you!